Rumors of a smaller iPhone continue to heat up, and where there’s smoke, there tends to be fire. The Wall Street Journal is now confirming Bloomberg’s report of an iPhone Mini, and they’re also revealing some new details about the device, including it’s codename, N97. iPhone Mini: Lighter, Half-Size, Edge-to-Edge Screen, No Home Button? According to WSJ, the new smaller iPhone is intended to be sold alongside the existing iPhone lineup, but it would be about half the size of the current iPhone 4 model. 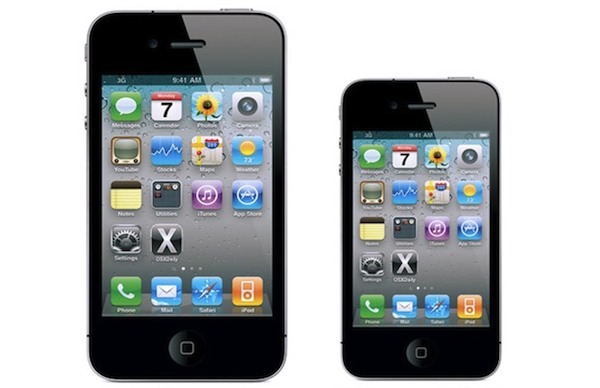 Citing an individual who saw a prototype, the iPhone Mini is “significantly lighter than iPhone 4” and includes an edge-to-edge screen that is entirely touch sensitive, indicating that the home button may be a thing of the past. The smaller iPhone will also include a virtual keyboard and voice based navigation, which would likely just be features of a future iOS version. Their source also says that the smaller iPhone will be available at about half the price of existing iPhones, which would allow cellular carriers to fully subsidize the upfront cost to the consumer. This would place the new smaller iPhone in direct competition to rival smartphones that are sold deeply discounted or included free with a service contract. The same WSJ report also indicates that the existing iPhone 4 and future iPhone models will have wireless syncing capabilities, thanks to an overhaul of Apple’s MobileMe service. This would allow users to access their entires iTunes libraries from anywhere via the cloud, rather than having to physically sync the iPhone to a computer to transfer the files. In addition to wireless syncing, the new MobileMe would also serve as a digital locker for multimedia, including photos, movies, and video. This would be offered as a free service. Both the new line of iPhones and the new MobileMe service are expected to launch this summer, but those plans could change, according to the WSJ’s source. A summer release could put the devices alongside the presumed launch date of iPhone 5, which is assumed to be released at WWDC 2011. Of course all of this is just a rumor, but it’s following a similar pattern to the Verizon iPhone rumors, with Bloomberg and the Wall Street Journal both confirming the devices independently through sources long before the public release. We’ll keep you updated on the iPhone Mini as we hear more. I would never go for the smaller one. I have never felt that the iPhone’s size was an issue. Personally, I don’t even think there is a market for phones that offer as immersive an experience in a smaller screen than the current ones.